St. Ita was born of Christian parents towards the end of the fifth century. She belonged to the noble tribe of the Decii in County Waterford. All her early biographers favor the pleasant metaphor describing her as the 'Brigid of Munster'. Actually the differences were more striking than the resemblances between those two foremost women saints of the Celtic church (see St. Brigid). Brigid's effective life as a nun was spent in continual movement. When she had made a success of one convent settlement, she moved off to found another. Organization was her bent. Ita did just the opposite. Instead of entering one of Brigid's convents, she founded another in a district where there was none, at Killeedy, County Limerick. There she remained all her life, courting retirement. Again, there is an emphasis on austerity in Ita's life not found in Brigid's. Ita's mortifications were on a par with those of the greatest contemporary missionaries. A strongly individualistic character is glimpsed in the legends of Ita. When she decided to settle in Killeedy, a chieftain offered her a large grant of land to support the convent. But Ita would accept only four acres, which she cultivated intensively. The convent became known as a training school for little boys, many of whom later became famous churchmen. One of these was St. Brendan, whom Ita accepted in fosterage when he was a year old and kept until he was six. The great Navigator revisited her between his voyages and always deferred to her counsel. He once asked her what were the three clings which God most detested, and she replied: 'A scowling face, obstinacy in wrong-doing, and too great a confidence in the power of money'. 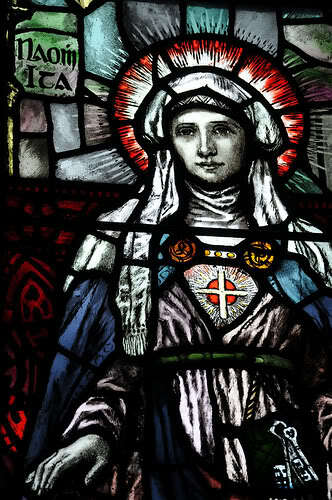 St. Mochoemoc, whom because of his beauty she called 'Pulcherius', was another great personage of the Celtic church she fostered in infancy.